There are a number of factors to bear in mind when organising an event of any scale. Choosing an event venue is often central to an event planner’s work and problems securing or decorating a location can up-end even the tightest of plans. 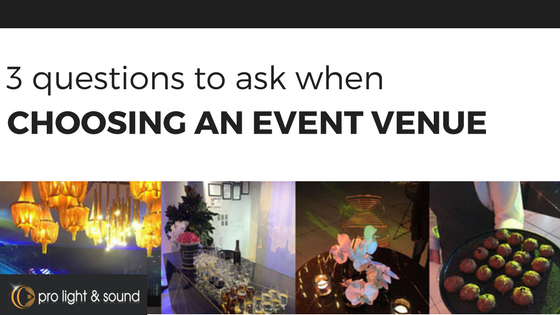 Be sure to bear our pointers in mind if you are tasked with choosing a place to host an event. 1. When is the venue available? Finding a location that matches your requirements and timescale is essential. There’s no point falling in love with the perfect venue if it’s fully booked – this is when planning in advance becomes a necessity. Don’t just assume that because a slot is free you’ll have access to the venue all day, either. This is especially the case if you have an extensive load-in and load-out collection. Make sure to consider how much time you’ll need before and after the event as well as during the event itself. 2. What facilities are there? As entertainment is often central to the event, don’t let the DJ be drowned out by poor device compatibility or the band be outshone by the wrong lighting rig. Asking the venue services staff to go into detail about how many plugs there are and which voltage they run can be essential to ensure that the equipment you hire is compatible. Plus, work with professional installers to ensure safety on the day. 3. What amenities are nearby? You want your guests to have the best possible time at your event – and that starts before the party officially opens. This means thinking about what parking and transport options are close to the venue – the event can’t be a success if your guests are unable to get there in the first place! Also think about ATMs and shops – guests may want to get cash out or stock up on essentials before entering the party. Plus, take into consideration neighbouring houses and other businesses – will they be affected by the function? Once you have made a decision on the venue, make sure you talk to the experts at Pro Light & Sound. With years of experience in sound and lighting equipment, they have the tools you need to take your event to the next level.